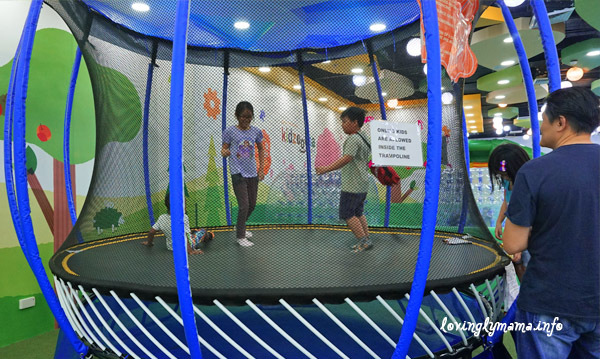 Kids love jumping around and so if there’s a trampoline, bouncing around would definitely follow. And in this case, it may be right for them because of the health benefits of trampoline bouncing. Trampoline bouncing has many health benefits for children. This is our little Shane during the birthday party of a friend last year. Bouncing on a trampoline is also called rebounding. It is great exercise for people young and old because it is low-impact and fun, too. 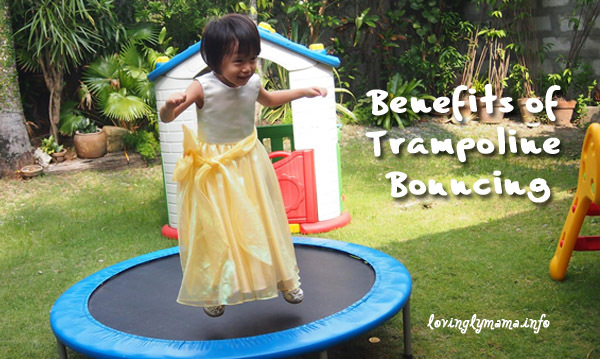 So here are some of the health benefits of trampoline bouncing for kids if done correctly. Have at least some supervision of an adult when kids are playing. When done correctly and regularly, jumping on a trampoline strengthens and lengthens the kids’ muscles. It also improves flexibility. 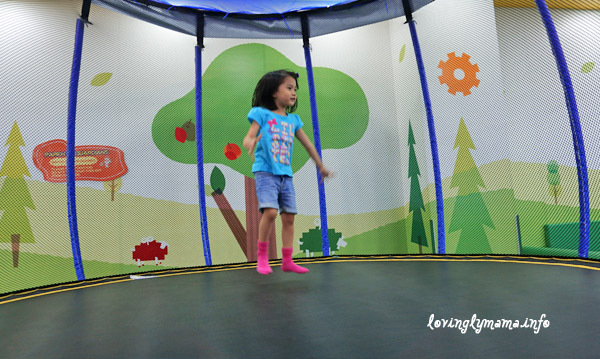 Jumping on a trampoline will obviously increase a child’s heart rate and gives their heart a great workout. After all, they don’t jump sparsely — they keep on jumping until they’re all out of breath! Or at least, that’s what my kids are. Our daughter Dindin with her friend Cody on the trampoline at Kidzoona Bacolod. Along with improving their balance, jumping on a trampoline can improve the kids’ posture. That is because the floor of the trampoline constantly moves so they must be aware of their center of gravity in order to avoid falling down. They try to to balance themselves to stay standing up. They can also use this balance in their other activities as well. When bouncing on the trampoline, the will learn specific skills. And mastering them would require persistence. As kids learn to control their balance and the movement of their body, this physical training on muscle control can also help them learn other things, too. Bouncing on the trampoline is so much fun for my kids. But Shane prefers it when she’s alone. She gets scared when the trampoline floor moves and she’s not the one causing it. When kids jump on a trampoline their whole brain is forced to function bilaterally. That is because both sides of the brain and both sides of the body must work in sync in order to maintain balance and coordination while bouncing on a trampoline. This will then help improve their motor skills, which starts from the brain. Needless to say, bouncing on the trampoline is great exercise. And the best thing is, the kids will not notice that they are working out because they are having so much fun. It’s like another toy for them. This is actually great for kids who don’t like sports, as they can do this even at home. Rebounding is especially good fun with a lot of health benefits for young children who are already obese. A lot of kids today are very much into sedentary activities like playing video games or watching videos. But introducing them to rebounding or the use of the trampoline will encourage them to move their bodies and have fun. And if they have playmates around, it is going to be play date already. 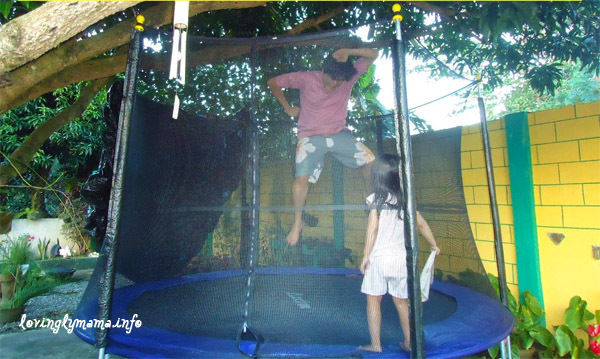 This is our existing trampoline that we haven’t used for a long time now because we don’t have space for it at our home. That is why I am thinking of getting a small one for our kids. We do have the big one but now, we realize that we have nowhere to assemble it in. And it’s too bad. But with the small one, at least we can just use it while in the living room. They can bounce on the trampoline even for a few minutes each day and still get the exercise that they need. That for me, is very important, as we are homeschooling in Bacolod. We try to bring them outside as much as we can, but it is also nice for them to have something to do at home. And while bouncing on the trampoline is great for kids, it’s great for adults, too. Too bad though that I get too dizzy jumping, but if not, I would love to do this, especially with my kids! That would then be a great family bonding activity for us. But well, I will let the kids just do it. Here are the health benefits of trampoline bouncing for grown ups. Undoubtedly, bouncing on the trampoline forces them to keep fit, to jump, to burn fat and be active. Better than being cooped up in the house and playing with gadgets. I don’t have any children but this all makes sense. I remember loving the trampoline as children. I would have never thought persistence. Jumping on a trampoline is just so much fun. I love the fact that it has other benefits beyond exercise. I can see the benefits of trampoline bouncing. I would have to think about getting myself one! I used to love jumping on them when I was a kid. It is amazing the benefits of a trampoline and they are so much fun as well! I miss my days of being about to bounce on one. I always wanted a trampoline as a kid. It’s so fun. Love reading all the health benefits of trampoline exercise/play! Trampoline exercises are so great even for adults! Well, ever since I learnt that the workout helps with detoxification, I’ve been such a fan. Great post, always wanted to get a trampoline for my kids. I really think there are so many benefits for their balance, muscle, exercise, etc.. I decided to get this for my little girl birthday, thx! oh this is such a great informative post about bouncing on a trampoline! we used to take the little one jumping but hear that it is bad for their bones? any thoughts? I never thought bouncing on a trampoline has a lot of great health benefits for kids and grown ups. It convinced me to do it from time to time. This is very much impressive. I grew up with a mini trampoline in my yard. I was grateful for it and when I have kids, I’ll have them one too. That’s so nice! Too bad we don’t have space in our yard for a trampoline. pfft. We have a trampoline in the backyard. It’s so much fun for the kids and agreat cardio for the adults!